Once (or sometimes twice) a week I cook a meal for my husband and I where I pretty much make whatever I want and feel like. I don’t count calories, fat, carbs or protein – just a “cheat meal” if you will (although I sort of hate to call it that because I like to think I don’t really restrict my food), where we can both enjoy a nice, flavorful dish. Life is to be enjoyed, and I certainly love good food, and I take pleasure in preparing and cooking my food as well. I find cooking therapeutical, being in the kitchen on a Sunday afternoon, handling multiple bowls of food while sipping on a glass of wine, with my favorite cheesy TV show in the background, while the dogs are sleeping in the living room and my hubby doing other chores in the garden or around the house. 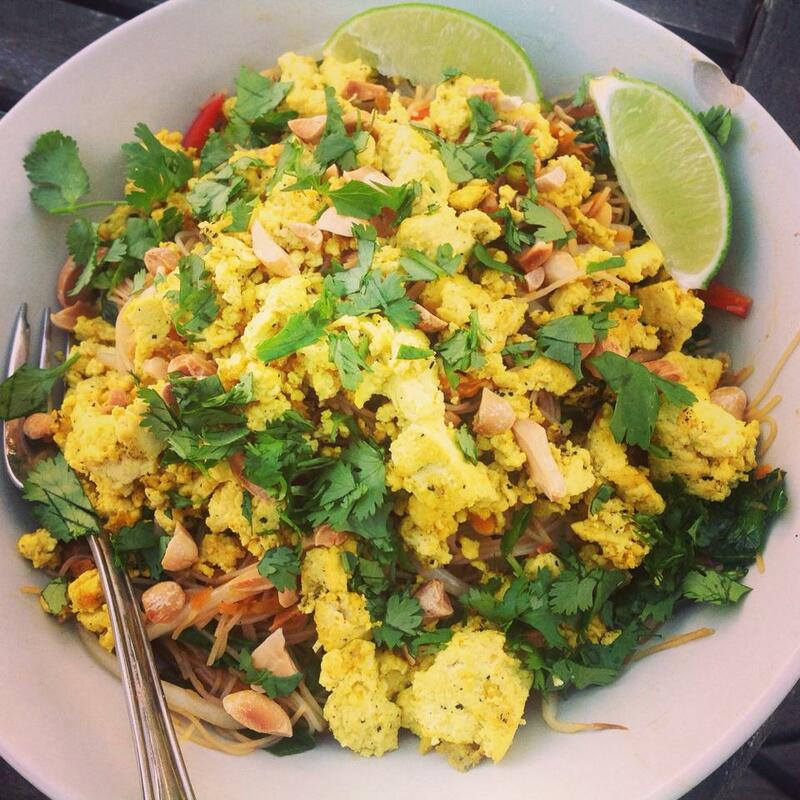 On Sunday I made a lovely Pad Thai packed with flavor, inspired by one of my favorite vegan blogs, Vegan Richa. Try it out – it may look like a lot of work, but once the veggies are chopped and everything is mise-en-place’d (French for “put in place”, or measured out and ready to be added to the pot) the dish comes together in 10 minutes! This is guaranteed much lower in fat, sodium and sugar than the version you will order in from your local take-out …. Use any Asian noodles you may have, I like rice vermicelli, they are thin and light and not too filling. The rest of the ingredients, such as tamarind and samba olek you can find in Asian grocery stores, online or even sometimes in your own regular super – or gourmet market. Bon appetit! 1. In a small bowl, combine the tamari, lime juice, tamarind, and sugar. Mix well and set aside. 3. Heat 1 tablespoon of oil in a large skillet over medium heat. Stir in the tofu, nutritional yeast, and turmeric. Cook, stirring, until the tofu is dry, about 5-8 minutes. Transfer the tofu to a bowl, season to taste with salt, and set aside. 4. Heat the remaining 2 tablespoons oil in the same skillet over medium heat. Add the mushrooms and carrots and cook, stirring, until the mushrooms begin to brown, about 5 minutes. Stir in the garlic, chili paste, and bell pepper, and cook until the garlic is fragrant, about 30 seconds. 5. Add the noodles, spinach, bean sprouts, peanuts, reserved sauce, and reserved tofu. Cook, stirring, until the noodles are tender but not overcooked, the sauce has been absorbed, and everything is heated through. Serve hot garnished with cilantro and lime wedges.